Many of us read and/or write thrillers, but Adrian McKinty’s own thrilling childhood has provided inspirational fodder for his latest book. IN THE MORNING I’LL BE GONE is the third book in the Sean Duffy trilogy by the award-winning Irish crime novelist, and it merges classic mystery tropes and modern thriller sensibilities with his first-hand experience in the Troubles in Northern Ireland. The author sat down with THE BIG THRILL this month to take readers behind the scenes of his latest project. I was born and grew up in Carrickfergus, Northern Ireland. I studied law and then philosophy at uni in England and then I moved to New York City. I was an illegal for my first few years in NYC working in bars, constructions sites, etc. Finally I married my girlfriend, got legal and I settled down with a job at the Columbia Med School library. In 2000, we moved to Denver, Colorado where I worked as a high school English teacher. My first novel, DEAD I WELL MAY BE, was written there. In 2004, DEAD I WELL MAY BE got short listed for the Dagger Award and was picked as the debut crime novel of the year by BOOKLIST. Tell us about your new thriller, IN THE MORNING I’LL BE GONE. It’s the 3rd book in my Sean Duffy trilogy that began with THE COLD COLD GROUND. It’s set in 1984, and it’s about a Catholic working in the largely Protestant RUC during the Troubles. What was your initial inspiration for IN THE MORNING I’LL BE GONE? How did the story’s premise develop through the early days of your writing process? I’ve always wanted to write a locked room mystery. Big fan of the genre and I realised that no one had ever written a locked room story within the context of a noir before, at least no one I’d read. So I wondered if I could pull it off—put that Golden Age trope inside a modern noir. The new book is the final chapter of the Sean Duffy trilogy. Do you have any plans to expand the series or carry over any characters for future books? I might do a fourth but my next book is completely different. It’s set in 1906 in the German New Guinea and is based on a true story about a murder among a group of strange German cultists, “the naked cocovores,” who believed naked sun worship and the eating of coconuts would make them immortal. It didn’t. What are some of the ways you’ve conducted research for IN THE MORNING? Any interesting stories there? There’s a hit and run early in the book. The police in 1984 knock some kid over and leave him in a ditch. That kid was me. I was hit by a police Land Rover in Ulster in 1984 and left for dead in a ditch. So I used that. Also when Duffy checks under his car every morning for mercury tilt switch bombs—I went through that process every morning too as I used to get a lift to school from a major in the British Army. The bad mornings were when he forgot to check and me and my little brother thought we were going to die. How much of yourself do you put in your characters? With which character in IN THE MORNING I’LL BE GONE do you most identify? I identify with Duffy. He’s pretty Bohemian and he’s got my musical tastes. He has better luck with the ladies than me, though. Bit of wish fulfillment there. I like Detective Sergeant McCrabban, because he’s a little like my dad. A slightly dour Ulster farm boy from the backwoods. When sitting down to write a new book, how much of an outline or plan do you usually create before launching into the first draft? It’s different every time. Sometimes I just write, sometimes I plan meticulously. I’ve written two books where I did the last chapter first and worked backwards. Currently it’s a novel by David Peace called RED OR DEAD because its style is so goddamn uncompromising. Everyone must have been telling him to do it a different way but he stuck to his guns. It’s always great to get back to New York City, particularly my old stomping grounds in Upper Manhattan: Harlem and Washington Heights. Epicurus. We’d talk philosophy. I’d also like to get Richard Feynman’s take on contemporary string theory and quantum mechanics or indeed about anything. A beautiful sentence, a good joke, an interesting character…things like that. Well I don’t really have a writing process. No set time, no word count a day. Sometimes I’ll work 15 hours straight, sometimes I won’t write anything for months or indeed years. Joseph Conrad said that a work of art should justify itself in every line and although I wouldn’t go that far I do think aspiring writers should try hard to write books that make them pleased artistically. Write for yourself, to make you happy, not a perceived and nonexistent lowest common denominator audience. I’m off to German New Guinea. I’m pretty good at posting to my blog. Many thanks to Adrian McKinty for stopping by to take readers into the fascinating mind and experiences behind his books. If you’re curious to see how he pulled off the “Golden Age trope inside a modern noir,” you don’t have long to wait. 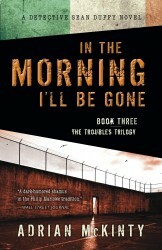 IN THE MORNING I’LL BE GONE, the thrilling finale to the Sean Duffy trilogy, hits stores March 4th. Adrian McKinty (St. Kilda, Victoria, Australia) is the author of fourteen novels, including Dead I Well May Be, Fifty Grand, Falling Glass, and, most recently, The Cold Cold Ground and I Hear the Sirens in the Street, the first two Detective Sean Duffy novels. 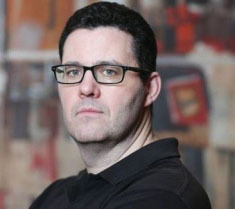 Born and raised in Carrickfergus, Northern Ireland, McKinty was called “the best of the new generation of Irish crime novelists” in the Glasgow Herald. To learn more about Adrian, please follow him on his blog.